"Because I am a Girl" is Plan’s campaign for fighting gender inequality, promoting girl’s rights and breaking the cycle of poverty. I was blown away with some of the facts that U magazine highlighted about the way girls are suffering at the very bottom of the social ladder. In times of economic downturn and poverty girls are most likely to suffer. As a girl it breaks my heart that in 2011 when some of us have iPhone’s, Laptops, a warm bed, food to eat and a safe home to sleep in, there are girls all across the world suffering from malnutrition because their brothers are fed first, living on less than $1 per day, denied access to health services and education and face extremely high levels of violence and abuse. Doesn't seem fair does it? So how can we help? And spread the word, on the 22 September why not set your status on your social network to “because I am a girl….) and add your own ending. Some of the influential women in Ireland have already given their thoughts on being a girl, why not do the same on your blog and social network to spread the word? Here are my thoughts on being a girl. Because I am a girl I ask….why can’t every girl in the world live happy healthy lives and be given the same chances in life to live the life they want. 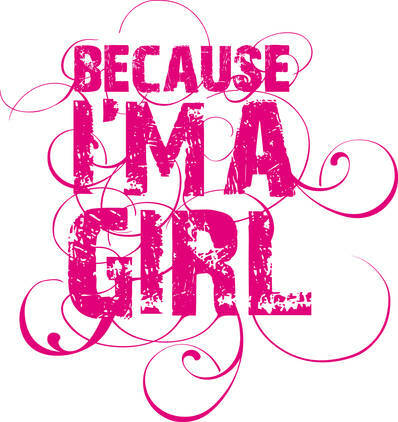 Because I am a girl I hope….one day women won’t be forced to live a life chosen for them. They will be able to marry who they want, have the careers they want to have and earn the money they deserve for the work they do. Because I am a girl I like…..that we are born with all the best skills, the ability to read others emotions, to be sympathetic, loving and compassionate. To read situations that our male counterparts can only dream of understanding. Because I am a girl I dislike....how we can be our own worst enemies. We need to unite not pull each other apart. Because I am a girl I feel….grateful for the chances I have had to a loving home and family because I know it could be very different. Because I am a girl I….am glad to be part of an extraordinary club, a huge worldwide club of females. We are awesome! Excellent post. I agree with everything you wrote, especially "Because I am a girl I dislike....how we can be our own worst enemies. We need to unite not pull each other apart." I sense that there is a greater deal of comradery between men - if they have a problem with each other they tend to settle it right away and then be cool with each other. We(women) should learn how to be as honest. So this is me being honest: I love your channel and blog! :) Greetings from the Czech Republic!